Artworks that look like palettes and palettes that are spoons...Ryan Gander's exhibition at Manchester gallery has got me thinking about what art might be. "A palette /ˈpælɨt/, in the original sense of the word, is a rigid, flat surface on which a painter arranges and mixes paints. A palette is usually made of wood, plastic, ceramic, or other hard, inert, nonporous material, and can vary greatly in size and shape. The most commonly known type of painter's palette is made of a thin wood board designed to be held in the artist's hand and rest on the artist's arm. Watercolor palettes are generally made of plastic or porcelain with rectangular or wheel format with built in wells and mixing areas for colors." 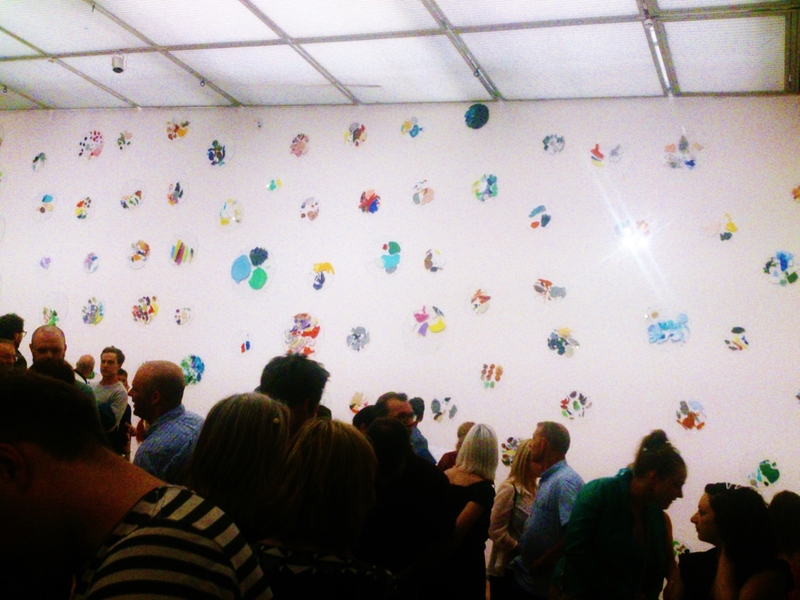 Here's a snap I took at Thursday's buzzing preview of Ryan Gander's exhibition, "Make Every Show Like It's Your Last" at Manchester Art Gallery. My favourite part of the exhibition was this wall of colourful discs. Instead of showing the paintings behind them, these are the palettes he was using for each one. It is accompanied by a laminated diagram with fantastically detailed descriptions of the people in the phantom portraits that co-ordinate with each paint splashed platters. "I paint myself every day but I don't show the portraits, I only show the palette. I'd have to kill you if you saw the portrait as you would know how bad a painter I am'. It is a discipline for him, as he admits he is "not a massive fan of painting", but this is conceptual work. Gander says it is "nice to have missing bits as it allows the viewer to imagine their own painting". The collection of palettes is a wonderful sight, I enjoyed picking out my favourites from the colour combinations and abstract formations. You can match up the palette to the description of the painting or enjoy them as they are, using your imagination to interpret them however you like. Some reminded me of petri dishes with colourful moulds and germs thriving happily. Others could be a blurred dinner plate, "On Today's menu a miscellaneous fillet and a smudge of peas". Gander said about his approach, "You can choose to engage or not. By leaving blanks there is room for you. If I hand it to you on a silver platter you won't like it" Or maybe on a silver spoon? I use these spoons to mix my pigments. Rather than washing off the material, by letting them harden I can then use them as colour samples, and also get the satisfaction of smashing of the solidified colour for future use. These reminders of my past makes are my version of a palette. This amazing formation was gifted to me by fellow Third Floor studio artist Olivia Pilling after I fell in love with these synthetic stalagmites in her workspace. Pilling's palette started out as an old dinner plate. The shapes made by the accumulations of materials which have formed whilst she skilfully works on her paintings are quite extraordinary. In creating her expressions on canvas she has simultaneously brought a unique 3D sculpture into existence. Even though the creation of this work was secondary it could sit equal to her meticulous and thoughtful paintings as one wouldn't exist without the other, made through the colours she has chosen and mixed with her own eye and hand. The palettes pictured below are from some of the world's most famous painters. As well as being important artefacts from their connection to the artists, they are beautiful, expressive objects in their own right. My favourite of these is this palette of Georges Seurat, conjouring up an image of conspiring figures wrapped in colourful cloaks. Hand shaping my pieces has left patterns of residue on the textured emery paper. I am really interested in the outcomes of working practices. Hands on methods of making often lead to other interesting outcomes, either forming a by-product or through observing sparking further ideas, feeding the creative process. When using wet & dry emery paper to shape my work it leaves beautiful patterns on the surface like the one above. In a strange way they are a sort of canvas, the strokes of colour made by the pieces marking the surface. It has been painted by jewellery.